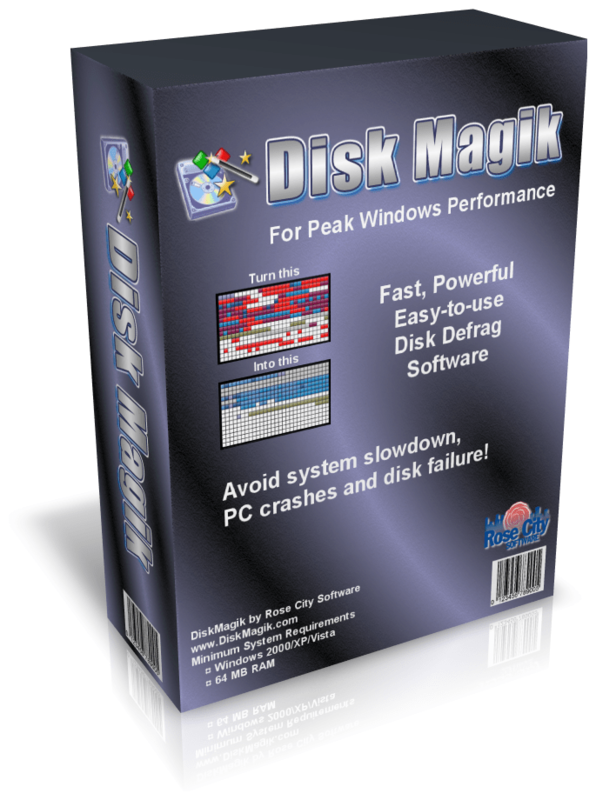 DiskMagik is designed to defragment the hard drive of a Windows PC. DiskMagik has several powerful features not included in the Windows defrag utility including the ability to rearrange and reprioritize the order of files on the disk, including the Windows Pagefile, permitting faster file access on demand. In addition, it includes optional Boot-time defrag and our exclusive “Proactive Defragmentation” technology. which gives you the option to run DiskMagik silently in the background at all times. A MUST-HAVE for all computer users interested in maintaining their computer’s performance to keep their system in peak operating condition. The hard disk drive on a Windows PC is by far the slowest component on your PC. Even high amounts of memory (RAM) and a fast processor cannot overcome the limitations of a slow disk drive… and nothing slows a hard drive down like excessive fragmentation! Although DiskMagik is a powerful tool suitable for advanced users, it is also perfect for the novice as well. A very user friendly multi step configuration wizard makes the initial setup a snap. Use DiskMagik with full confidence to enhance your computer’s performance and keep your system in peak operating condition. Good choice; large family of software–visit their websie. As files are being constantly read, written, deleted, and resized on a disk drive, fragmentation occurs. It is the process by which files are broken down into small fragments and these are spread out over several locations on the disk. Fragmentation causes slow read and write speeds, reduce PC performance, long boot-times, random crashes and freeze-ups, and in extreme cases even a complete inability to boot up at all. That’s why we need to perform defragmentation on the disk drives, it is the process by which access speed is increased by rearranging files stored on a disk to occupy contiguous storage locations. A Disk Defragmenter utility is part of Windows by default, and there are many third party applications available too. DiskMagik is a simple yet poweful disk defragmenter, that comes packed with features that aren’t present in the native Windows disk defragmenter. It can help you keep your PCs disk drives at top operating conditions. The installer size is ~3MB, and the installation process is simple and straightforward, taking no time at all to complete. Launching the application for the first time, a registration window appears, you can activate the application, using the license key and other information. Once done, a Configuration Wizard opens up to allow you to configure the application for use. Once done with that, you can see all your disk drives listed on the UI, along with buttons and also graphic representation of fragments. You need to analyze disks to be able to see how fragmented it is. The UI is well-arranged and clear-cut, and comes with a simple look and design. The well-thought arrangement of the UI makes it easy to access all the features and options of this application. It is easy-to-use for all types of users, even the ones with less experience. On the top is the menu bar with ususal drop down menus, followed by a toolbar with buttons to useful options and features. The area under it lists all the drives along with information like Status, %Done, %Fragmented, %Free, No. of fragmented files, and last manual defrag date. Under it graphical representation of Clusters on the drive using blocks. These blocks are different colored depending on what category they fall in. A key is provided at the bottom about what different block colors mean. – Clean & Easy-to-use UI, designed to be easy to understand by all types of users. – Three defrag modes to suit your needs. Quick Defrag, Complete Defrag, and Advanced defrag. – Automatic boot-time defragmentation during every boot. – Auto Defragmentation when the disk is idle to the set treshold level. – Defragment removable drives also. – No SSD detections, it considers the drive as HDD and attempts defragmentation on it. – No option to defragment a certain folder or directory location, for example the Game folder. DiskMagik is simple and reliable application to defragment your disks. It may be missing on a few important features like SSD detection, but it does it’s job of defragmentation well. It runs smoothly without any lag or crashes. It is definitely recommended.